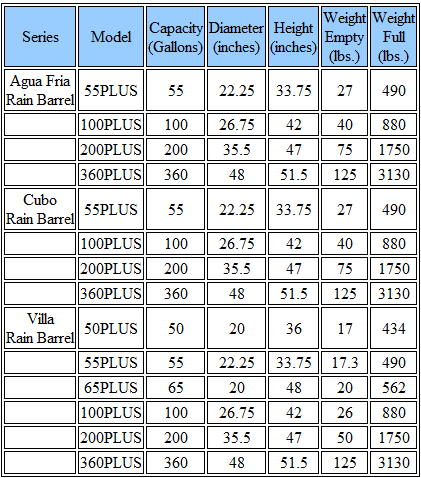 The Desert Plastics Villa 200 Gallon Rain Barrel is a great solution for rainharvesting! There are rain catchers and then there are Tijeras Rain Barrels. Our attractive, economical and innovative rain barrels are expertly manufactured to meet your specific needs. 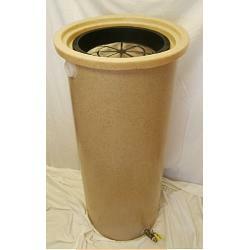 Tijeras Rain Barrels are made from recyclable virgin resin, FDA approved for contact with potable water. Our valves and fittings are professional grade, and all fittings are welded into place. There are no gaskets, which means "no gaskets - no leaks". We guarantee it! Custom fittings locations are available at no additional charge. Desert Plastics, LLC, hereinafter referred to as "DP", warrants to the original purchaser of the product and related parts, except valves, to which this warranty relates, hereinafter referred to as the "Product", that it will, as detailed below, repair or furnish a replacement in the event of a failure, should such failure be determined by DP to have occurred in the course of normal use and service, or, at DP's option, refund the purchase price of any Product found to be defective in workmanship or material. Such refund, repair, or replacement will be made through the original place of sale, within the applicable periods specified. WARRANTY: If the Product provided by DP fail within one (1) year of the date of sale, DP will, at its option, repair, replace, or refund the purchase price of any Product found, upon inspection by DP or its authorized agents, to be defective in workmanship or material. Defects or malfunctions resulting from failure to properly install, secure, use, or maintain the Product and it's components in accordance with the printed instructions provided. Failures resulting from abuse, accident or negligence, including, but not limited to, the use of chemicals "generally known" to be harmful to the Product. Products or parts that are not installed in the United States, and in accordance with all applicable local codes, ordinances, and good trade practices. All valves and related components. The manufacturer of the valve warrants them. Any and all damage resulting from freezing temperatures. CONSEQUENTIAL DAMAGE: DP shall not be responsible for any loss or damage to personal property in or near the Product or other consequential damage to the extent such damages are excluded under applicable state law. No responsibility is assumed for loss of use of the Product or inconvenience therefrom. SERVICE LABOR RESPONSIBILITY: In making repairs or furnishing replacement, DP assumes no responsibility for any labor expenses for service, removal, or reinstallation. Such costs are the responsibility of the purchaser. SHIPPING COSTS: Purchaser will be responsible for any cartage, including the cost of returning the replaced Product to the place it was first delivered. HOW TO MAKE A CLAIM: Any claim under this warranty should be made to the place of purchase. The original receipt must accompany all returned Products. NOTE: No one is authorized to make any other warranties on DP's behalf. Any implied warranties, including merchantability or fitness for a particular purpose, shall not, with respect to the Product, extend beyond one (1) year from the date of sale. This warranty is extended to the original purchaser only and is only transferable upon written permission from Desert Plastics. 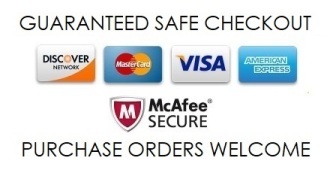 DP makes no other warranty of any kind, expressed or implied, except that the goods sold hereunder shall be of merchantable quality and the buyer assumes all risks and liabilities resulting from the use of the goods and Products, whether used singly or in conjunction with other products.